Welcome to Shadyside Presbyterian Church’s web home! We’re delighted you’ve found our website; we’d love to welcome you in person. We hope you will take the time to learn more about our faith community by browsing through the site. Below, we’ve collected answers to a few of the most common questions first-time visitors may have. Of course, we invite you to contact the church office if you have a question or concern which you don’t feel is addressed on the site. Please don’t hesitate to call 412.682.4300 or send an email message to info@shadysidepres.org. The church is situated on the corner of Westminster Place and Amberson Avenue, just one block off Fifth Avenue in the Shadyside neighborhood of Pittsburgh, Pennsylvania. Get a map and directions. Some might see our impressive stone building as intimidating and surmise that it houses an affluent congregation that might be cold and unfriendly, but we’re eager for you to encounter Christ through some of the warmest and most welcoming folks you’ll ever get to know. If you are curious about our worship practices or style, please visit the worship archive on the site – where you can listen to full-length audio files of recent Sundays’ worship services and sermons. 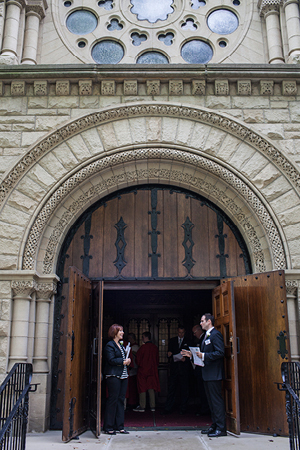 When you arrive at Shadyside Presbyterian Church, you’ll find folks in coats and ties as well as shorts and sandals. However you choose to dress, please feel comfortable joining us as we worship the God who always sees us as we are. Plenty of on-street parking is available surrounding the church. On Sunday mornings, parking is even permissible on both sides of Fifth Avenue nearby. (Please note that parking is restricted for one block between Wilkins and Amberson Avenues on the inbound side of Fifth Avenue. Parking is available on the outbound side in that block, as well as both sides of Fifth Avenue from Amberson Avenue toward Oakland.) A limited number of handicapped parking spaces are reserved along Westminster Place. During the week, you’ll find it most convenient to enter by way of the office entrance, which is accessible from Westminster Place. Look for the small portico extending out toward the sidewalk. The church is accessible to wheelchairs. Throughout Shadyside Presbyterian Church, we are eager for children to learn that the church is a special place for them, where they belong, are loved, have friends, and find important service to do. On Sunday mornings, Shadyside Presbyterian Church offers a Nursery for the youngest among us (infants through pre-schoolers) beginning at 9:30 a.m. The Nursery remains open through the close of worship. Age-appropriate Christian education for children and youth occurs from 9:30 a.m. to 10:45 a.m. on Sunday mornings. These options are only a brief overview of our children’s program. For details on the full range of children’s offerings available at Shadyside, you may wish to visit the Children’s Ministry page of the site. Guests are always welcome to participate fully in the life and worship of this community, but if you are interested in joining our church family, we rejoice in the opportunity to recognize our commitment to one another in a relationship united in Jesus Christ. Read more about membership and join us!